Watch four of Caeleb Dressel’s swim at the 2018 SEC Championships. After an amazing SEC meet as a senior for Caeleb Dressel, one has to wonder: how does this affect his teammates? 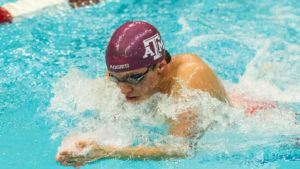 Though never winning an individual title, Mauro Castillo scored big points for the Aggies, placing 2nd in the 100 fly as well as the 100 and 200 breast. 2018 SEC Wrap-Up: After Big Showing, What Will Dressel Swim at NCAAs? One of the big questions after Caeleb Dressel’s outstanding showing at the SEC meet surrounds his NCAA schedule. Seidt battled back down the final stretch, outsplitting Bratton to take the win by 18 hundredths. Steve Bultman bellyflops onto a pile of balloons. 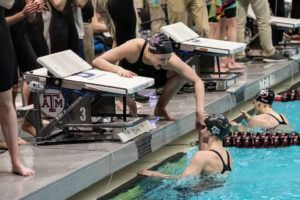 The swimming world will turn its attention to College Station, Texas this week as the SEC Championships for both the men and women will kick off on Wednesday night. The action takes place at the Rec Center Natatorium from Wednesday, February 14th through Sunday, February 18th. 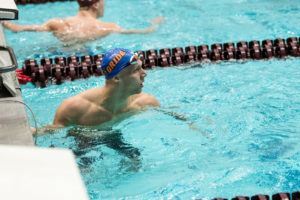 The Florida Gators will be looking to extend their streak with a 6th-straight SEC Championship title, with Caeleb Dressel swimming in his final SEC meet. Dressel swept his individual events last season, winning the 50 free, 100 free, and 100 fly and putting up some blistering relay splits. They’ve also got defending SEC champion Maxime Rooney and reigning NCAA champion Mark Szaranek, among several other returning medalists on the roster. While the Gators look very tough to beat, we could see the top 5 getting shaken up a bit. Georgia and Auburn lost a few key players to graduation with the likes of Kalisz, Clark, Duderstadt, Patching, and Darmody now gone, but a few freshman (namely Auburn’s Hugo Gonzalez and Georgia’s Camden Murphy) could step up and bring in a lot of points. Tennessee, Alabama, Texas A&M, and South Carolina will look to challenge for one of the top spots. With Alabama’s sprint group looking strong, they could break into the top 3. Alabama – Luke Kaliszak (senior backstroker/freestyler), Chris Reid (senior backstroker), Laurent Bams (junior freestyler), Zane Waddell (sophomore sprinter), Robert Howard (junior freestyler) – Kaliszak and Reid are both vying for backstroke titles. Reid is the defending 200 back champ, while Kaliszak placed 2nd in t he 100 back last season. Auburn – Peter Holoda (senior sprinter), Zach Apple (junior freestyler), Hugo Gonzalez (freshman back/IMer), Hugo Morris (senior fly/freestyler), Scott Lazeroff (junior diver), Luis Martinez (senior butterflier), Petter Fredriksson (sophomore backstroker) – Gonzalez has already been making waves as a freshman. Apple is one to watch as he’s coming off a big summer. Florida – Caeleb Dressel (senior sprinter), Mark Szaranek (senior IMer), Jan Switkowski (senior fly/IMer), Maxime Rooney (sophomore freestyler), Khader Baqlah (sophomore freestyler), Michael Taylor (freshman backstroker) – This will be Dressel’s final SEC meet. He’s the heavy favorite to defend his titles in the 50 free, 100 free, and 100 fly if he chooses to swim those events, but could potentially shake up his schedule after his blistering 200 IM at midseason. Georgia – Jay Litherland (senior IMer/freestyler), Gunnar Bentz (senior IMer/flyer), Javier Acevedo (sophomore free/backstroker), James Guest (junior breaststroker), Walker Higgins (sophomore freestyler), Camden Murphy (freshman butterflier) – Bentz is a bit of a question mark this season. He’s Georgia’s top returning scorer, but was out of competition for most of the season with a collarbone injury despite returning to training shortly after. Kentucky – Sebastian Masterton (junior diver), Isaac Jones (senior freestyler) – Kentucky graduated a handful of its top swimmers after last season, but Jones returns after picking up big points in the distance freestyles. LSU – Juan Celaya Hernandez (sophomore diver), Karl Luht (sophomore backstroker), Jake Markham (senior freestyler), Matthew McClellan (junior diver) – Luht was a finalist in the 100 back as a freshman, while Celaya Hernandez was a diving champion and the SEC Male Freshman Diver of the Year. Missouri – Mikel Schreuders (junior freestyler), Daniel Hein (sophomore backstroker), Kyle Goodwin (junior diver), Luke Mankus (junior sprinter), Nick Alexander (sophomore back/IMer) – Hein was a 100 back finalist as a freshman last season and an All-American as a member of Missouri’s medley relays. South Carolina – Akaram Mahmoud (senior freestyler), Cody Bekemeyer (junior freestyler), Fynn Minuth (junior freestyler), Tom Peribonio (senior free/IMer), Nils Wich-Glasen (senior breaststroker), Brandonn Almeida (freshman IM/freestyler) – The Gamecocks are loaded in the middle distance to distance freestyles and should pick up quite a few IM points with newcomer Almeida. Tennessee – Kyle Decoursey (junior freestyler), Peter Stevens (senior breaststroker), David Heron (senior freestyler), Liam Stone (senior diver), Sam McHugh (senior IM/flyer), Ryan Coetzee (senior butterflier), Joey Reilman (junior back/freestyler) – Decoursey is one of the Vols’ standouts so far this season, and should bring in a lot of sprint points. Texas A&M – Brock Bonetti (senior backstroker), Mauro Castillo Luna (senior breaststroker), Jonathan Tybur (senior breaststroker), Sam Thornton (junior diver), Tyler Henschel (senior diver), Angel Martinez (junior butterflier) – Castillo Luna is in the running for the NCAA breaststroke titles this season, and Bonetti should be a finalist in both backstrokes. 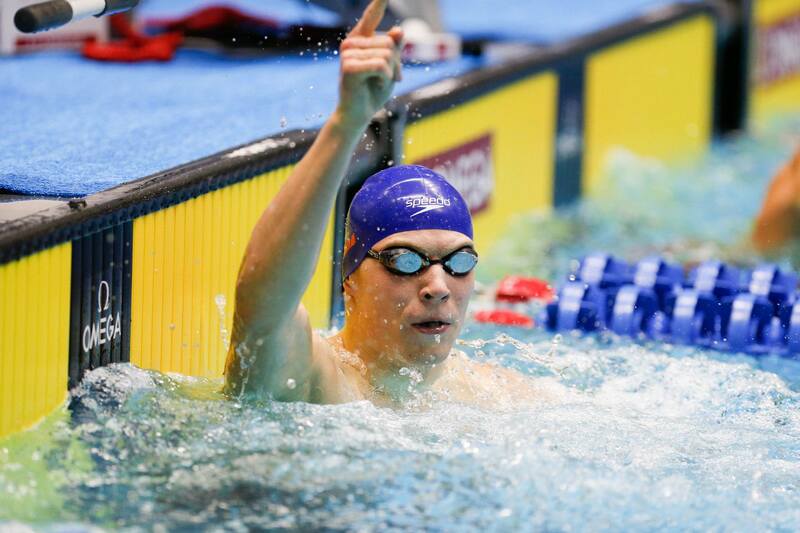 400 IM- The 400 IM should be a good one, with last season’s runner-up Mark Szaranek of Florida headlining the event. There to challenge will be Georgia’s Jay Litherland and Gunnar Bentz, who are both All-Americans in this race. Auburn freshman Hugo Gonzalez could also challenge for the win. 100 Breast– Tennessee’s Peter Stevens has some serious speed, but he’s up against 2017 runner-up Nils Wich-Glasen of South Carolina. Texas A&M’s Mauro Castillo Luna has a chance to be right there with them. Florida’s Chandler Bray returns after finaling last season. 200 Back- Defending champion Chris Reid will battle with Auburn freshman Hugo Gonzalez here. Both Reid and Gonzalez have best times in the 1:39-range. Florida freshman Michael Taylor, an Olympic Trials finalist, is another one to look out for. Georgia’s Jay Litherland and Texas A&M’s Brock Bonetti return after making the final last season. 200 Fly– We could see a good battle here between Georgia All-American Gunnar Bentz and returning medalists Jan Switkowski and Mark Szaranek of Florida. Hugo Morris, the 2016 SEC champ in this race, returns for Auburn. South Carolina’s Fynn Minuth and Georgia’s Mick Litherland are also returning finalists. Our Swimulator tool (reminder – doesn’t include diving) would have Florida winning this meet by about 120 points over Georgia. That won’t take into account Gunnar Bentz, however, who wouldn’t have much of an impact on Swimulator’s rankings, but should at the meet (even if he’s had only a truncated season after breaking his collarbone early in the year). Georgia can also expect more from their divers than Florida can. Is it enough to close the gap? We think a riot might break out if we picked against Caeleb Dressel – and we won’t – but data points to this meet coming down to the last day, depending on how tapers go. Georgia depth will be the key. An interesting fact – if you Swimulate the meet scoring to 24 places (which is how the meet is scored), Georgia ranks 2nd. If you Swimulate it to 16 places, Georgia falls to 4th. That means that the middle-of-the-lineup Bulldogs will have to come through big for them to upset Florida. There’s another interesting battle for the 3rd-8th positions as well. 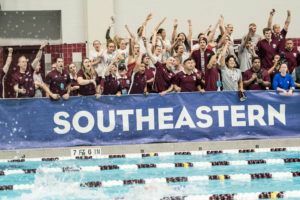 South Carolina has a few studs and a chance at a top-10 finish at NCAAs, but the depth hasn’t quite arrived for the rising program The same could be said for the Texas A&M Aggies, though A&M has a better diving corps with the likes of defending conference 3-meter champion Tyler Henschel. Missouri is not the 8th-best team in the conference – however, as is well-known by now, they go after cuts mid-season, and then fully train through the conference like almost no other team in the country does. For example, last year, they were seeded to win SECs, but only came out 5th. Tennessee, Auburn, and Alabama are all pretty even in swimming, especially with Alabama’s Robert Howard, Tennessee’s Kyle Decoursey, and Auburn’s Zach Apple all emerging as a true national sprint threats (Howard is the fastest 100 freestyler in the conference this year in 41.99 – yes, faster than Dressel). If the tie-breaker is diving, then Tennessee has it in spades. Between Liam Stone and Ohio State transfer Colin Zheng, they have two NCAA diving champions on their roster. Tennessee’s swimming roster might not have some of the name recognition as other SEC teams (or past Tennessee teams, for that matter), they have a lot of guys who have flown under-the-radar to top 1 or 2 seeds at SECs. Where they lock that top-end star (backstroke), they make up for it with a lot of depth (4 guys in the top 13 of the 200 back, including #4 Sam McHugh). Great review. The Tennessee Men are deceptively good, perhaps a better NCAA team than conference BUT certainly good enough this year to finish 2nd at best and 3rd at worst. Good movement for the mightly Vols after a .5 point deficit which left them 6th in 2017. Could the Vols continue the climb and be in the mix next season with the “Chomp-Chomp Gators” for a heavy weight title bout? Call me crazy but me thinks so as the Gators lose the farm this year. Dressel will swim the 200 im, 100 fly, 100 breast and 100 free. I thought a swimmer was only allowed to swim 3 individual events? Where are you seeing the psych sheet? 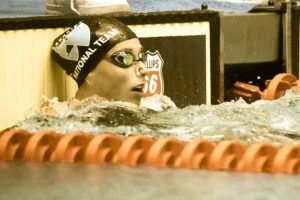 If it is an earlier version, many swimmers are entered in more than 3 events and have to choose before final entries are determined. There’s a live result link that has the seeded entries on the championship central page. Florida enters their swimmers in nearly every event on the first psych sheet. It’s always been this way. You can enter as many as you wish pre-meet, it looks as though Dressel is entered in basically every event he has swam this season.